The spiral rope chain is a very easy and versatile stitch. It can be used to make bracelet or necklace chains or larger items like straps for amulet bags or beaded purses. Spiral ropes can be made with many different types of beads. It is easy to learn using 11/0 seed beads (not cylinder beads) in two different colors. Once you get the basics down, it is easy to change the type and size of beads you use in the rope - although it always helps to make a sample to make sure the size and colors work well together. It only takes the most basic beadwork materials to make a spiral rope chain. Two types of 11/0 seed beads, beading thread, and a needle. We have made spiral beaded ropes with Fireline, WildFire and Nymo beading threads. Any of them will work as long as they will fit through the core beads multiple times. Making a spiral rope takes a lot of thread, so we highly recommend you pre-stretch and condition the thread with thread heaven or a similar thread conditioner. We tried making a spiral rope with Nymo without a thread conditioner and the thread kept getting tangled on itself. It is definitely much easier with the thread heaven. Tulip beading needles are good for this project since they have some give, but are not so flexible that they get bent out of shape during use. If you have never used Tulip needles, they are available in a Tulip Assortment Pack with a size 10 long and short, size 11 and size 12 - everything you need to decide if they are right for you! Your spiral rope will be made with two different color beads. One is used for the core and the other is used for the outside of the spiral. We will refer to them as core beads and spiral beads. Start by picking up four core beads and three spiral beads. Slide them down the thread to leave about a six-inch tail. Put your needle back through the first four core beads. Pull the thread tight to form a small circle. Press the spiral beads flat against the core beads and push them to the left side. You honestly don't need to push them to the left side, just make sure you consistently move them to the side. As a right-handed beader, it gives you more room to insert your needle down the core beads. To make the next stitch, pick up one more core bead and three spiral beads (a silver bead and three gunmetal beads in my example). Put your needle back through the last four core beads (skipping the first core bead). Pull the thread tight to make another loop of beads. This is what the beads look like before we shift the newly added spiral beads to the left side. Continue stitching the spiral rope by picking up one core bead and three spiral beads. Stitch through the previous three core bead and the one you just added. Try to maintain good tension on your beadwork. It will help make the spiral tight and avoid having thread showing between the stitches. Continue stitching in the same manner until your rope is the length you want. It will take at least five or six stitches before you will start to see the spiral forming. The key to the spiral forming is that the outer beads length is shorter than the core beads. This causes the core to curve slightly around the outer spiral beads. In this picture, you can see the ends of the core beads are forming an 'S' shape starting to curve as more stitches are added. As more spiral stitches are added, the spiral effect is more obvious and pronounced. Beads that have good color contrast work well with the spiral stitch. This sample shows the same spiral beads and a variety of core beads. We used this sample to decide which bead combination we think works best. We ended up choosing the last combination of gold lined white beads. 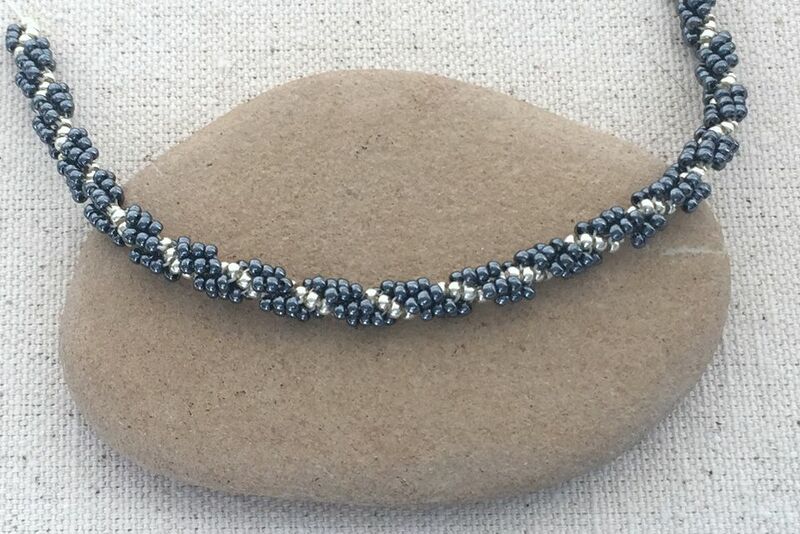 This sample uses 8/0 core beads and 11/0 spiral beads. The optimal combination will result in a stitch where the length of the core beads in a stitch is slightly longer than the spiral beads in the stitch. Each stitch in this spiral rope has five spiral beads and four core beads. A good way to finish your spiral bead rope is to use long cone findings. Not only will they provide a finished look, but they will cover the edges of the beadwork which are uneven and probably more likely to get caught when you are wearing it.